Thanks for a great challenge last week, your Thank You cards were beautiful! This week our challenge theme is POLKA DOTS, we challenge you to make cards for our heroes to send home to their family and friends using polka dots! I can’t wait to see your card creations! Our sample card maker this week is Elizabeth! To see more of her wonderful art work please visit her Visions of Paper blog. She also has something special on her blog for you! Thank you Elizabeth for sharing your awesome creativity with us! 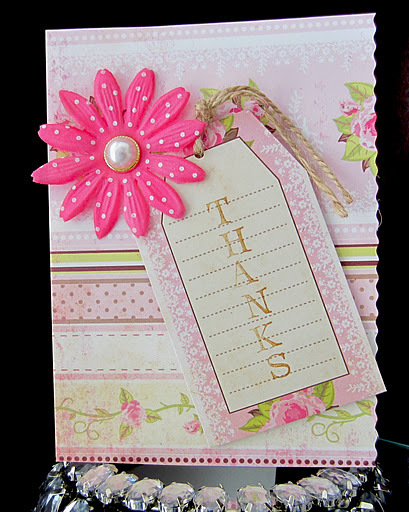 Thank you Elizabeth for being our sample card maker this week, your card is lovely! Elizabeth, I am so excited you used a shipping tag on your pretty card! We just had a tag swap the Scrap to Treasure page on FB. Fun! You inspired me to use another tag for the polka dot challenge. Lovely sample card Elizabeth! Such pretty papers and the polka dotted lower is so pretty. I love tags but always have a hard time using them on my cards. Yours looks wonderful here!